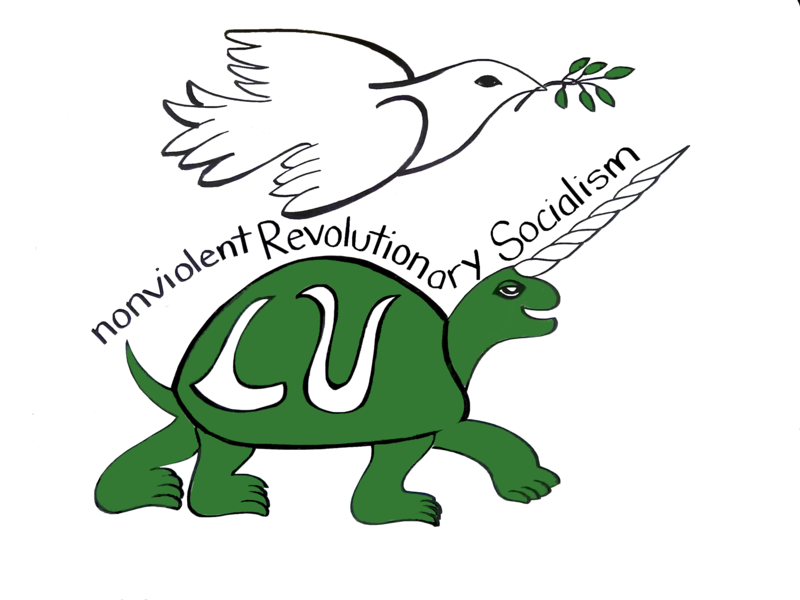 Liberty Union is a non-violent socialist party, founded in the state of Vermont in 1970. We offer a slate of candidates for all statewide offices in all general elections. We affirm this platform as a socialist platform operating within a capitalist economy. 1. Government ought to move in the direction of assuring that the wealth and resources of the world will be used to provide a materially secure life for all people on the planet— including opportunities for universal health care, quality child care, and education from birth to death—simultaneously preserving the planet and its resources for future generations. 2. Democracy should exist at all times in all the processes of society. 3. Everyone should have the right of choice and privacy, free from government interference, as long as these choices do not negatively infringe upon or cause personal harm to others. 4. Everyone should have socially productive and personally satisfying work available and a universal basic income (UBI) generating a real sense of security. 5. Everyone is entitled to a fair rate of return for their labor and that rate of return should be the same for everyone. 6. All genders should be treated with respect and dignity having equal rights and sharing equal responsibilities. 7. Senior citizens are valuable and important members of society and should have the right to meaningful participation in society, free from economic deprivation. 8. Nuclear power is intolerably and incurably unsafe. We oppose the existence and construction of nuclear power plants. It is imperative that all nuclear power plants be decommissioned immediately in the least hazardous manner, with environmentally responsible clean-up of all nuclear waste and all resulting costs borne by the investors. We further demand that research, production, testing, deployment and sale of ALL weapons including nuclear, depleted uranium, biological, chemical and reactor waste immediately cease. We demand a universal conversion to alternative renewable energy sources. 9. It is wrong for any country to take advantage of the labor and resources of any other country. 10. Utilities, communication services—internet and phone, and transportation services, are necessities which must be available and affordable to all. 11. The following “Declaration of Independence from Government Dictation of Conscience” is an historic document of the Liberty Union Party. It was written in the throes of the “American War in Vietnam,” during the era of the so-called Cold War with the (then) Soviet Union. The language reflects this context. Today we are deep into the time of the “worse wars” that we predicted would come. We remain committed to bearing witness against all wars and to speaking out for peace. Therefore, we call for TOTAL UNILATERAL DISARMAMENT on the part of the United States, regardless of what any other nation may do. We must raise the standard of WORLD-WIDE human love and SOLIDARITY. our RESPONSIBILITY to REFUSE to be used or co-opted by any of the bloody wars or empires. war preparations, which are part of the wars. We cannot do everything—especially in view of our individual limitations. But we CAN and MUST SPEAK OUT for peace and NON-VIOLENCE—NOW. A war to end war is a snare and a delusion—like our destroying a village in order to save it. There is no way to peace—PEACE IS THE WAY. said we mutually pledge to each other our lives, our fortunes and our sacred honor. DARE WE DO LESS THAN THIS? 12. All prisons should be replaced by humane rehabilitation facilities. 13. All national, political and economic borders should be open. 14. No person should be defined as illegal. We categorically oppose the identification, harassment, arrest and deportation of any so called immigrant, regardless of documentation status. 15. All people must have the right to express opinions, ideas and dissent through all forms of non-violent assembly and protest, not confined to “free speech zones,” and this right must be insured and protected by government. 16. We oppose fascism. We assert that a conspiracy to commit genocide, ethnic cleansing, torture, wars of aggression, or to deny human rights to groups of people is criminal. Creating a theoretical framework to commit genocide, torture, ethnic cleansing, wars of aggression, or to deny human rights, is also a criminal act. 17. We seek to dismantle racism and white supremacy upon which our county and other imperialist counties were built. We recognize the enduring legacy of racism which continues to disadvantage people of color in the U.S. and Vermont and seek to negate its effect in Vermont, the U.S., our own institutions and ourselves.